Lasting Hearts was started by Kimberly Saldaña, friend of mine and Director of Sales at Hero Arts. The charity serves women who have suffered the loss of a child in miscarriage – and provides each one with the book “Mother of all Mothers,” with a handmade card inside that carries an encouraging note. As of now, there has been over $6600 raised – and 1000+ cards. WOW! Thank you to all who have given…if you haven’t had a chance yet, please do so! You can donate cards and funds, see the links in the “how to help” section at the bottom of this post. More background about the Lasting Hearts organization is on their Facebook page. PS As this is for a charitable cause, none of the product links in this post are affiliate links. Hero Arts did provide me with the stamps ahead of time so you can see them; I’m donating 2x the cost of purchasing all three stamps to Lasting Hearts, since I would have bought these anyway! (This seriously needs to be called positive for a good cause, doesn’t it??) Negative painting is focusing on the areas AROUND the image in order to make it show up in the painting. I saw the dies in the fundraiser Stamp n Cut set and knew what I wanted to do! I’ve done something similar on instagram and folks wanted to know how, and hearts were the perfect item to use to teach it to you. Watch the video below, or click HERE to see it in HD on YouTube. I kept the card simple – adhered it onto a card base and added bling. Boom. Done. Note inside is the most important part….just write something short and sweet. “Please know that I am praying for you today. Hugs, Sandy in Washington state.” I posted about this cause previously HERE if you want more ideas! Donate funds: CLICK HERE TO DONATE! Enter the giveaway– check it out on the Hero Arts blog! What a great idea! As a labor and delivery nurse I have been in the counseling and comforting side. Having had three miscarriages myself and unable to have children I’ve been on the grief side. Neither side is easy. But knowing someone cares always help as some point. Very pretty. Thanks for sharing your talent. Beautiful card – you always have such great creations! Beautiful and a great technique! Love your techniques and details (pinned them), and your card definitely tells the story of three hearts (mom, dad and baby). Beautifully done and great way to send hugs! Very nice card Sandy. Love how you put it together. Thanks for sharing. Lovely cause. I’m busy making cards with some friends to send in. Thank you for the inspiration. What an encouraging card! I like this cause. I wish there was something like this last year for my son’and his girlfriend. They lost their first child due to miscarriage. Beautiful and thoughtful card. You make it seem so simple! Such a beautiful card Sandy. You make it look so easy. Your watercoloring is truly beautiful. Thanks for sharing your talent with us. Great looking card…I saw your video on making this card…it turned out really nice.. This is a wonderful cause and often overlooked. I’m so glad that more attention is being given to this. The set is beautiful and I hope to see the book in our hospital. Sandy what a great idea with mama, daddy and baby. Only you would have thought of that. Thank you. Sandy, once again you outdid yourself. Simply beautiful! Love your hearts paintings that is truly awesome. Love, love, love your card. The colors just melt into one another. Truly stunning. Very pretty card…love this interesting technique. This book sounds wonderful for those who are dealing with such a devastating loss. What a beautiful card, Sandy!! You are a generous lady. Wow!!! What a lovely initiative!!! Your card is amazing!!!! Pretty cool Sandy!! I don’t have any powder colors right now but looks like fun! This is such a beautiful card and enjoyed watching how you created this! Also, touched by the campaign and inspired to make some cards to send. 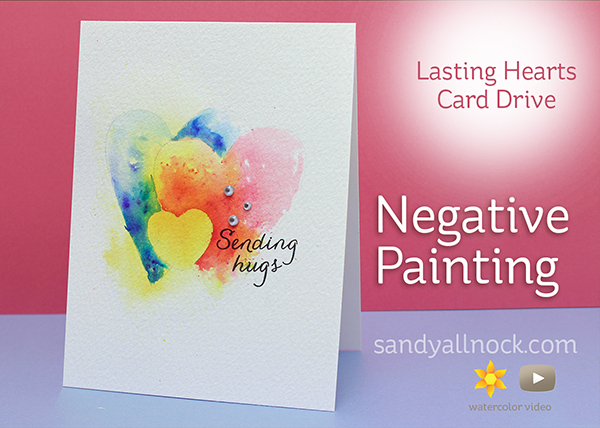 That card is so pretty.. And i feel this campaign so much with my cousin went through last week..
your water painting is gorgeous! I love the sentiment, too! I love this technique. A really beautiful card. Great card. Someone will be honored to get this. 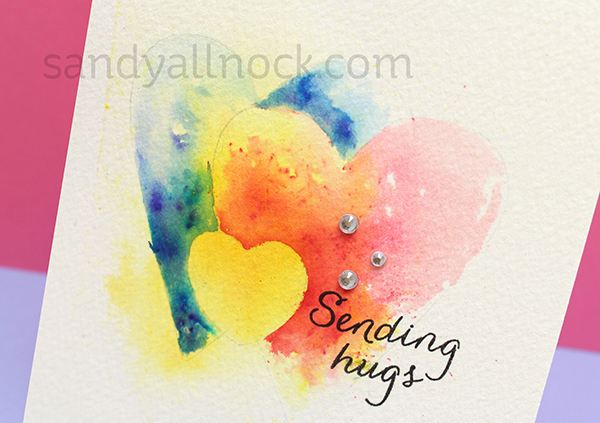 What a gorgeous card, so touched by the way you grouped the hearts to represent the family!